At the VHEC’s symposia on the Holocaust, students engage with a historian and a Holocaust Survivor Speaker. The symposia also include a film excerpt and a Q&A panel. A symposium on the Holocaust held each spring for senior high school students. Teachers and students engage with a historian, Holocaust Survivor Speakers and a keynote speaker. The symposium also includes a documentary film excerpt and a student Q&A panel. This symposium is offered to diverse schools in the Lower Mainland. The date for the upcoming Annual Symposium is to be confirmed. Space is limited. Schools on a wait list from the previous year will be given priority. Indicate the name of your school and how many students would like to attend the symposium. A staff member will then follow up with you. Half-day district-wide symposia are held October through May every year in various school districts throughout Lower Mainland school districts, as shown below. Each symposium consists of a historical overview of the Holocaust, a documentary film excerpt, a Holocaust Survivor Speaker presentation and a student Q&A period. Known dates and locations for 2019 are listed below and others will be posted on an ongoing basis. Generously supported by Coast Hotels, the Michael Levy Family, The Lohn Foundation, the Vaisler Family in honour of Syd & Sari Vaisler and Naomi & Mac Adler, and the VHEC Lovi Memorial Endowment Fund in honour of Anna (Abrahamsohn) Lovi, Dr. Joseph Lovi and Dr. Marta Lovi. Additional support provided by the Jewish Federation of Greater Vancouver & the Province of BC. Generously supported by VHEC Funds: Lilli and Izak Folk Memorial Endowment Fund, Edwina and Paul Heller Holocaust Education Fund, Joseph and Mary Bulles Legacy Endowment Fund, Sid and Sylvia Eibschutz Endowment Fund, Sophie Waldman Endowment Fund, Leo Krell Memorial Book Fund, Meyer and Gita Kron Fund, Ruth Kron Sigal for Excellence in Holocaust Education, and the Lehrer Endowment Fund. Additional support provided by Coast Hotels, The Lohn Foundation, Michael Levy Family, Jewish Federation of Greater Vancouver, UBC and the Province of BC. This symposium was informative, engaging, and though provoking. 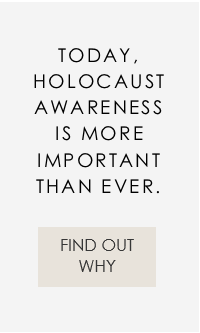 It really put a ‘human face’ on the Holocaust. The symposium is an excellent supplement to in-class education. Surrey District teacher"...excellent supplement to in-class education"
Grade 12 student"...Really made me think"